It’s been quite a while since I wrote one of these, but I’ve been busy with building mainly boring backend things. 1. 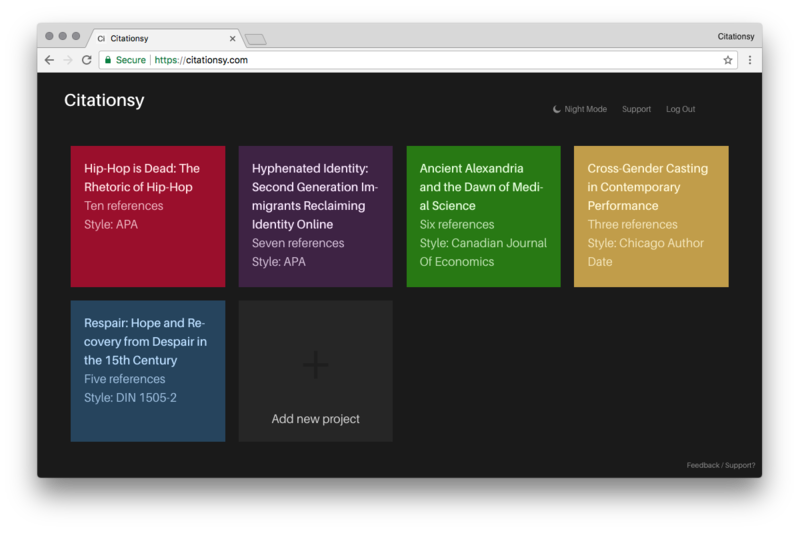 Music referencing has arrived in Citationsy. You can now search for a song from a database of over 40 million songs to automagically create a citation for it. You even get a little album cover image on the search. 2. Finally: Alphabetic sorting of references! Not much more to explain than that, really. I know lots of you have been asking for this, and I finally built it. 3. There was a very annoying bug that would sometimes cause people’s references to disappear. I believe I have managed to fix it, but if it ever happens to you: please email me and I will take care of it. If you have been affected by this bug in the past please get in touch and I will add a month to your subscription by way of apologising. A couple weeks ago Citationsy was named the #1 EdTech startup from Scandinavia to look out for.